This week I did a lot of work on the script and I spent a while working on one of the creature models for our animation. Ethan and I met with a film professor to discuss problems with our story. He had a lot of useful critiques and it has led us to completely changing our script yet again. We lacked not only character conflict but character motivation, two very important story telling elements. After two meetings with the entire group we discussed ways to solve all our problems and we now have an outline for the new version of the script. Pros: Our story is really coming together and I think with just a bit more push it will be great! Cons: Gonna be some more work fixing up the script but it needs to be done. 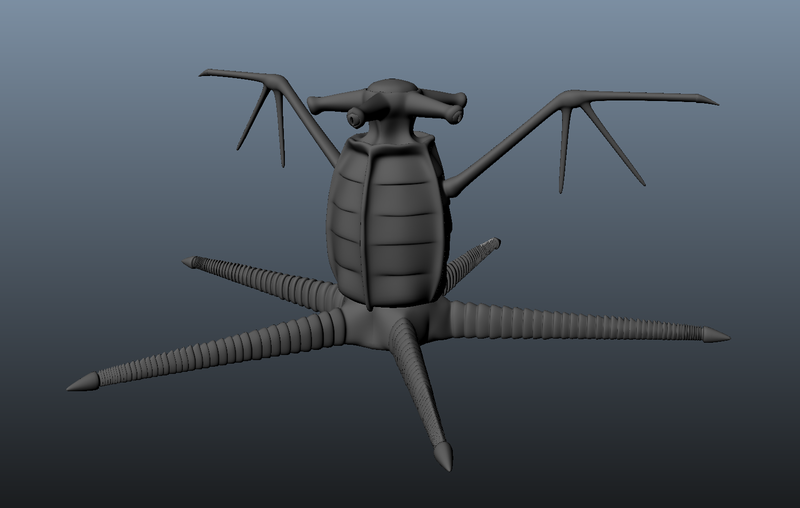 I worked on the model of the Elder thing. I’ve just about got the base mesh finished and once that is done I will be throwing in some quick and dirty joint chains to pose the model as if it is trapped in the ice. Once this model is done, posed, and UV’d I will be moving onto helping Pat with other models from our master asset list.